With so much to choose from at a drug store, picking out beauty and skin care products can be a tad bit overwhelming. Many of you have asked me what my favorite go-to drugstore brands and products are so I decided to make this a two part post. I am breaking it down to beauty products this week and affordable drug store skin care next week. You do not have to spend hundreds of dollars to achieve great beauty results. The following products are affordable, reliable and little gems that I love and recommend. 1. Aquaphor Healing Ointment- This is my secret weapon for cracked heels and dry hands. It is a must have in the fall and winter when dry chapped skin is more likely to occur. 2. Unscented Witch Hazel With Aloe Vera- The benefits of witch hazel are endless and this is one of those products that every woman should have on hand. Use it as a toner, treat razor burn with it and more. 3. Shea Moisture Raw Shea Butter Shampoo- A restoring shampoo that makes your hair smell fresh and incredibly soft. I also love that this product is formulated without parabens, synthetic fragrance, synthetic color or sulfates. 4. Covergirl Lash Blast Volume Mascara- BEST drugstore mascara ever. Makes your lashes long, thick and clump free. I even like this better than some of the higher ends ones that I have purchased from Sephora. 6. Tweezerman Tweezers- these are high quality and they will last you forever. They are a little bit more pricey than other brands but they are totally worth it. 7. Neutrogena Oil Free Eye Makeup Remover- I love this because it gets the job done, does not irritate your eyes and does not leave an oily residue. 8. Neutrogena Skin Clearning Oil Free Makeup- This foundation not only offers excellent coverage but it also helps heal existing acne with the blemish fighting ingredient salicylic acid. 9. Neutrogena Shine Control Blotting Sheets- These are perfect to throw in your purse and use whenever you feel like your shine factor may be getting a little out of control. They won't remove your makeup and will not irritate your skin. 10. Revlon Just Bitten Kissable Balm Stain- For the perfect punch of color and moisture all in one this is the product. My favorite shade is Honey. 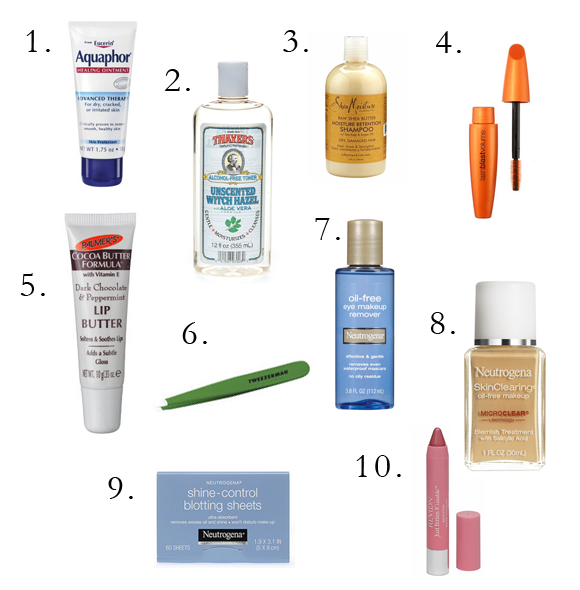 Do you have any beauty drug store must- haves? I would love to hear! Such a great round up. Thank you! Thanks I'm going to get some of these! Great tips. I am going to have to look for the Palmers lip butter. I agree, particularly with Aquaphor and mascara. I'm a Sephora junkie, but I've not found a better mascara yet. It's the only part of my makeup routine that I actually use a drugstore product for. That Palmers lip butter is magic. I'm allergic to Aquaphor but find The Honest Company's Healing balm is about the same. It's not drugstore but it's great. Love these ideas...the oil blotters are really the best! The Aquaphor is key. Especially for babies with really dry skin too. Like both of mine have! I need to start using on my heels though..they have been so bad lately! I just bought this mascara again yesterday...LOVE it! And I agree, it's so much better than some of the higher brands I've tried in the past! One of my favorite drug store buys is Luster NOW! Instant Whitening Toothpaste. It whitens instantly and doesn't irritate my super sensitive teeth/gums like whitening strips. I swearrrr by the Revlon Just Bitten Balm Stains. I have Honey, Cherish, and Lovesick. They're amazing! Cant agree more on the Witch hazel,cover girl mascara! My fav drugstore beauty are NYX blush (available in target now) ELF brushes esp. Kabuki and eye shadow at 1$! ,Clean&clear blotting sheets and my recent fav. of Simple eye makeup remover and face foam wash.
love reading your blog,esp the skincare tips are amazing.Been doing the vit C routine for a while now,thanks to you! Love this! I'll be trying some of these for sure. Can't wait for Part 2!